Page 3 of 3 - How To Build A Delta Kite: MBK 2-Skewer Delta. 20 pound strength Dacron line is ample for all the Skewer Series kites. Mark out a triangle on some spare plastic, as per the dimensions on the template. Cut out the triangle and tape down 2 lengths of flying line onto one side, as in the photo. Use clear sticky tape. 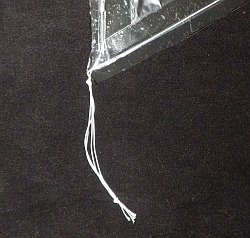 Now flip the plastic over and tape down another 2 lengths of flying line, directly over the first 2. Where two pieces of line cross the edge, carefully tie a Multi-Strand Simple knot. Position it so it touches but does not crush the keel plastic. See the photo. 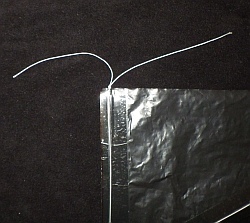 Where the four pieces of line come together, tie a Multi-Strand Simple knot against the plastic as before, then tie another one further out, as in the photo. 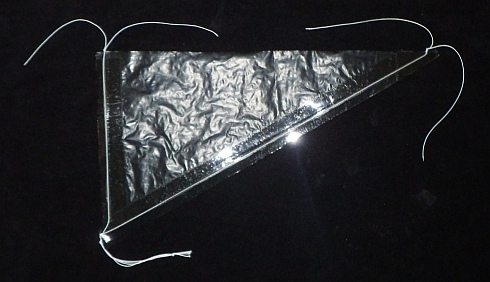 Using a spare skewer, poke a hole in the plastic sail 0.85SL (24.7cm, 9 3/4") from the nose of the kite, in line with the vertical spar. 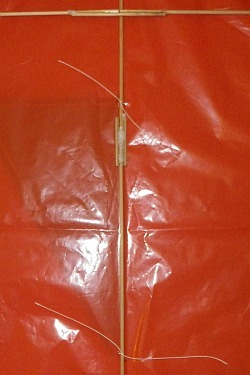 Thread the upper keel lines through this hole and tie off tightly around the bamboo, with a Granny knot. Using the keel itself to find the exact spot, make another hole in the plastic for the lower lines. Thread them through and tie off tightly as before. The photo shows both the Granny knots. 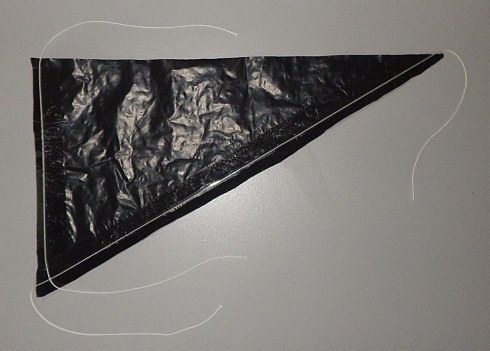 With the keel flat against the plastic sail, add sticky tape between the knots, attaching the keel to the sail plastic. Then flip the keel over and do the same on the other side. At this point, you're nearly finished making the 2-Skewer Delta! It's a good idea to put a small drop of glue over the two Granny knots, so they won't come undone or slide along the bamboo. 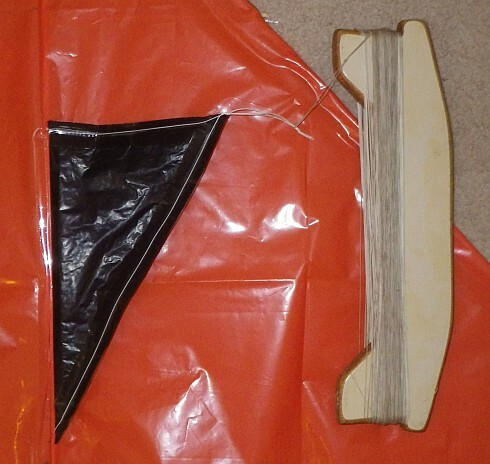 If the spar is not reinforced, this kite can't be pushed too hard in not-so-light winds before it starts to flap. Adding the extra skewer doesn't cure this behavior completely, but it does extend the range of wind speeds in which the kite will fly smoothly. Finally, make up a flying line and attach it to the keel with a Lark's Head Knot. See the photo above, which shows the Larks Head tightened against the second knot in the keel lines. Assuming there is some breeze outside, just dangle the kite at arm's length until the wind catches it. As long as you feel the kite pulling, let out line slowly by letting it slip through your fingers. Delta kite stories of my real-life flying experiences are worth checking out! Another way to launch is to get a helper to hold the kite up and let it go, with maybe 10 or 20 meters of line let out. This way, the kite soon gets high enough to make it easy to let more line out. You could also try pulling it along the grass, with the keel on the bottom of course, until the kite pops into the air and climbs away. 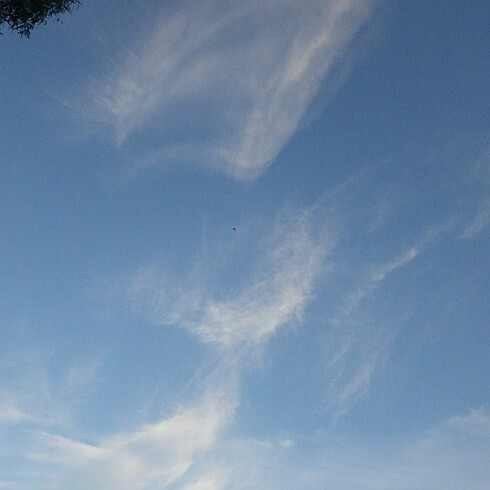 Up there is a picture of the MBK 2-Skewer Delta Kite Mk2, merely a dot in the sky at 350 feet off the grass! Have fun flying, and I hope you've enjoyed learning how to build a Delta kite.